Can amateurs publish in palaeontology? As for the paper itself, it does point out something that may become a future problem for paleontologists. I know of several amateur and commercial paleontologists who believe they aren’t allowed to write peer-reviewed papers to be published in journals because they aren’t professional paleontologists or work at a university (in fact, this even applies to a couple museum paleontologists who work at non-university public museums). I started to write a reply to this, then realised it was important enough to merit its own post — so here it is. So the commenter’s amateur friends should just go right ahead and start participating in the world of professional palaeontology. They’re welcome, so long as their stuff is good. Thing is, “participating in the world of professional palaeontology” entails things like copy-editing the careless mistakes out of your manuscript, getting your citations and references to match, reading and understanding the existing literature to recognise where your work fits in and what actual evidence supports the position you’re setting out to overturn, submitting the manuscript to a recognised journal, and putting it through peer-review. The brontodiplodocus manuscript is being dismissed by the professional community because it didn’t do any of these things — not because the authors aren’t professionals. Galiano and Albersdorfer 2010:fig. 11A. 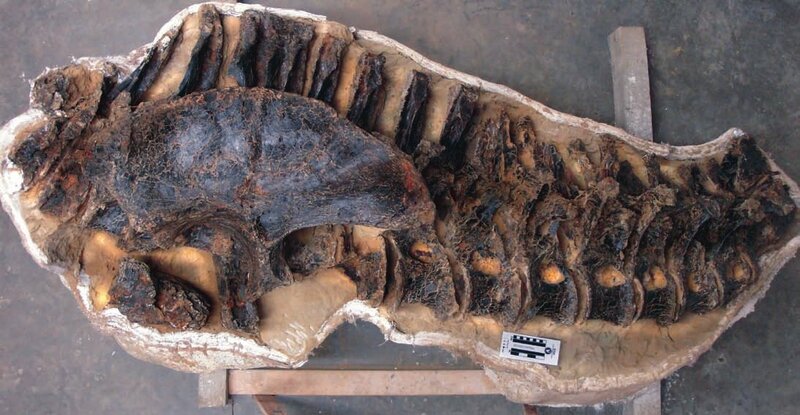 Right lateral view of “Amphicoelias brontodiplodocus” specimen DQ-TY, dorsal, sacral, and anterior caudal vertebrae articulated with ilium, partially exposed in field jacket. Or that if they donate their specimens to a public institution so they can be publicly available they will be barred from studying the specimens and/or they will go to someone else to name. It doesn’t help that some paleontologists actively cultivate this view towards amateur and commercial paleontologists. Who does? I have never heard of a professional palaeontologist denigrating an amateur or commercial for donating their scientifically significant specimens to a public institution. Never. If an amateur or commercial paleontologist dots all their i’s and cross their t’s, subject their papers out to peer review, and place the holotype fossils in a publicly available institution, then why shouldn’t they be allowed to publish stuff? I don’t want to keep bashing on and on with the obvious example here, but I myself am an amateur: in the seven years since I started to work seriously on palaeo, I’ve generated a total palaeontology income of £215, for an annual income of £30 p.a. (That’s a £40 interview fee and a 200 Euro travel grant.) I do all my work in my spare time, fitted in around a demanding day-job. I am in fact the very model of an “amateur”, i.e. one who does it for love rather than for money. That’s not stopped me from getting my work published — some of it in very good venues. It needn’t stop anyone else, either, if they’re prepared to do the work. A better example, and one that Matt mentioned last time, is the man who is arguably the most respected in the whole field of sauropod palaeontology: Jack McIntosh, whose careful, detailed work over the last few decades has all been done in his spare time, and which constitutes a legacy of important papers that are still much referred to today. The bottom line in the professional-vs.-amateur dichotomy is not in fact whether you get paid for what you do; it’s whether you conduct yourself according to your discipline’s professional standards or not. And that is a choice that everyone in the field (whether paid or not) makes for themselves. I know of people who are paid to do palaeo and who do not conduct themselves like professionals (though, thankfully, not many of them); and I know of unpaid people who are functional as professionals. For this reason, I actually think that professional/amateur is unhelpful nomenclature when discussing these matters. But we’re stuck with it, and I’m not going to try to change the world. Just remember, everyone: in the field of palaeontology, you’ll be considered professional if and only if you conduct yourself as a professional. [*] OK, “Anyone can submit a manuscript to any journal” is a very slight oversimplification. There are a few journals that don’t accept unsolicited submissions, or that only accept them from members of a specific society, or what have you. But these area vanishingly small proportion of the whole journal-space, and no-one should be put off from submitting to the other 99% of journals because of the existence of this 1%. This post made me want to publish in vertebrate paleontology as well. Sadly, much of vertebrate paleontology has become a field that is highly complex and requires a very broad background knowledge covering many fields, and detailed and in-depth knowledge of selected others, so that becoming “professional” in one’s scientific output is very hard to manage on an amateur’s time budget. However, those who manage (e.g., Mike Taylor) are usually immediately accepted by the professional community, because we value their fossils and especially their research. Having had much the same misconception myself, I am heartened to learn I was wrong. However, this does seem the right time and place to raise a related issue – it is all well and good accepting the work of an amateur if it is of a high enough standard, but am I correct in thinking that it is very much more difficult for amateurs to gain access to the relevant source material and artifacts in the first place, thus reducing the chances of their being able to produce such a piece of work? I completely agree with Mike’s post. I’m also an “amateur” (sensu Anonymous 2010), and since 2005 I’ve collaborated with several museums, with a total income during my modest “paleo-experience” (6 peer-reviewed papers, 2 in review, 3 abstracts, and my review of others’ papers from 3 international palentological journals) of ZERO euros. My real jobs during these 5 years have all been completely non-paleontological. I write my studies, see the specimens, read the literature and (when it happens) review other authors’ papers in my spare time. So, what that anonymous commenter wrote is, in my opinion, merely rethorical. I’m absolutely delighted that one result of this post has been that Gunnar now wants to publish in VP! There is a huge amount of work waiting to be done — plenty to go around — and the field can only benefit from having more people doing professional-grade work. I’d love to be able to say no, it makes no difference; but of course we don’t live in the ideal world we’d like, and things aren’t quite that simple. To do vertebrate palaeontology you need access to two things: specimens and literature. And amateurs are indeed at a disadvantage in accessing both of these. SPECIMENS: these are the big problem. Museums are understandably wary about letting Joe Random Tourist into their collections and giving them free rein, and you do need to establish some kind of credibility to get into most collections. There are various ways you can do this. One is to publish a paper or two, so you can point to them as evidence of your seriousness — if you can find areas you want to work in that don’t rely on specimen access to start with. Similarly, giving talks at conferences can help to establish you as an actual worker rather than a fanboy. Another approach is to volunteer at the museum, so they get to know and respect you. A fourth approach (and the one I took) is to get affiliated to a university, so that you can make initial contact with collections under the university’s umbrella. (More on how to do this another time.) Finally, if you’re working with a recognised palaeontologist, you may be able to initially visit a collection as that person’s collaborator, and get to know the collections staff that way. This is one of those problems, I think, where once you start to solve it (i.e. people start to know who you are), it gets much easier much more quickly. LITERATURE: happily, this is much less of a problem. When I started out seven years ago, it was very hard to get access to papers without an institutional affiliation, but the rise of PDF in that time has completely changed the landscape. Most papers can be obtained just by googling the titles: either that’ll take you straight to a PDF (as in, for example, all of my own papers, which I post online). Failing that, it’ll generally get you to an abstract page that wants you to pay an insane amount of money for access to the paper. Screw that: instead, email the author whose address is given on the abstract page, asking for a PDF. In my experience, every author is always delighted to send a PDF to someone who’s taking an interest in their work. So I think that even a completely unaffiliated amateur coming into the field cold can get hold of the literature necessary to do some useful work. And there are ways to become recognised in collection-holding institutions so you can start to work on their specimens. I should write a whole article on this some time. That’s good news. I will have to tell them that. I think you misunderstood what I was saying there. Either that or I didn’t elaborate well enough. The kind of paleontologists I was talking about are the kind who talk down to amateur paleontologists with the kind of context like “you can’t publish papers, you’re just an amateur with no degree”. Of course, not all paleontologists are like this. Many of the professional paleontologists I’ve seen on sites like Tetrapod Zoology or SV-POW are courteous towards amateurs (as are other amateur paleontologists and the like). Mike also nicely sums up some of the problems I’ve seen amateur paleontologists face when attempting to get published. There does seem to be a bit of a chicken-and-egg problem when it comes to accessing specimens for research. In many cases (but as Mike mentioned, not all), first-hand access to the specimens is needed to write the paper and correlate observations. But in order to get access to specimens you need to publish papers. I do agree though that the development of the Internet and online journals such as PLoS ONE has broken down several of the barriers that exist for amateurs that try to publish. Agreed, the brontodiplodocus manuscript was very unprofessional and did deserve to be ripped a new one. The only reason I brought this subject up was it seemed the criticisms of the paper seemed to be more aimed at the way it was published and the nature of the authors rather than its findings. Of course, it could be said that the occasional “diving-in-the-deep-end” (to paraphrase one commenter on the situation) paper by amateurs makes the entire amateur community look bad. I’d add into this that specimen access need not be an issue. You don’t have to see specimens to publish papers. Of course many things are impossible without specimen access and others will be better with it, but there are lots of things that can be done with a good idea, time and some literature. I don’t get to see tons of specimens and have published several papers that basically were specimen-free or where my contribution didi not require direct access. Now I’m not saying this is necessarily a great thing, but just to make the point that you can do things even if you can’t get across country or to another continent to get to a museum. Again, as Mike notes, there are lots of ways of getting involved before you publish or get to see material and this is not only not a barrier but will help. If you want to get imbued with how the system works then going to meetings, talking to people, helping in museums, etc. will help you get what you want, it’ll get you some informal ‘training’ and if you really want to get publishing, it’ll help you get to where you want to go. Reading these comments I think the real issue here is that people are hitting these barriers and not realising that actually these barriers are either not hard to breech (getting hold of papers), non-existent (not being ‘allowed’ to publish) or are only an occasional hazard (bad refereeing). In this case, what it seems we need to do is get people to realise how easy it can be to get started (if getting something finished can be really hard!). I completely agree with you David. And I see your point about how getting involved before publishing can help. The problem of “ad hominem” refereeing (where the referee telling the journal whether or not to accept bases a decision on the authors reputation– or the reputation of the institution the author is affiliated with– instead of the content of the paper) is, I think, a real one. (There have been actual experiments: submission of the same paper with different author identifications: turns out it helps to have a male rather than female given name.) In Mike’s horror story it was up front and explicit, but it can also be a subconscious thing, the referee being unaware of what has biased them. Some journals (this is common in my own academic discipline, philosophy; my impression is that it is less so in the “hard” sciences) have a “blind review” policy: the author submits a draft of the paper without author identification on it, which the editor supplies to the referee without telling who the author is. I don’t think this is the biggest problem in academic journal publishing, or that blind refereeing solves the problem totally (I know I have often been able to guess the author of a paper given me to referee! ), but I think it is a GOOD practice, and if (this is about as likely as a 10-kilometer-asteroid falling in Yucatan) the editors of, say, the JVP asked my advice, I would recommend it to them. As a 44 year-old amateur I have been thinking for some time about how to become more of a palaeontologist and less of a collector. I am just about to embark on an OU (I’m resuming studies I started at Birkbeck) Open Degree to get a qualification and for the interest, but I have to say this article has come as a real confidence boost. I’ll look forward to the article on affiliation to a university too. If you don’t enter this field with a professional mindset, I really can’t see the point in entering at all. Mind you, I’m not trying to sell fossils. First of all: You never ever, ever, EVER, want to publish on a specimen that you have not looked at or worked with directly. PERIOD. Publishing on an image or drawing in someone elses paper is not acceptable. Secondly: The reason most “amateurs” (and I use this term very loosely, because many amateurs are actually more experienced with field work than the doctorates), are “unable” to publish is that the specimens they are most likely finding and working with are not held in the public trust. Most professional org’s, and mags, have rules directly against this. The specimens most amateurs are most likely working with, are in private hands and thus are not “available to the public for periodic study in perpetuity”. So… sure “amateurs” CAN publish, but they can either publish on specimens that were collected by others, OR be forced to donate what they find to an “aceptable” academic institution before they write and hope those in the power of that acceptable institution allow them to tag along on the description. Yes, journals and societies do insist that the descriptive papers they publish are on specimens that are properly reposited. Quite right too, otherwise the results of the study aren’t repeatable. And yes, if an amateur owns an interesting specimen and wants to publish on it, that means donating (or selling may be possible) to a proper institution. But there’s no need to tag along on anyone’s coat-tails: you could make it a condition of donation that you get to lead-author the description.